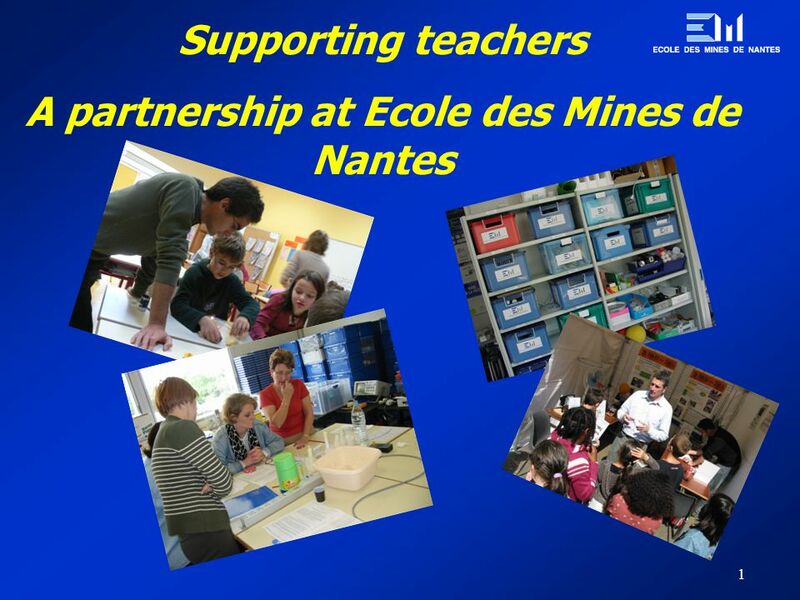 1 Supporting teachers A partnership at Ecole des Mines de Nantes. 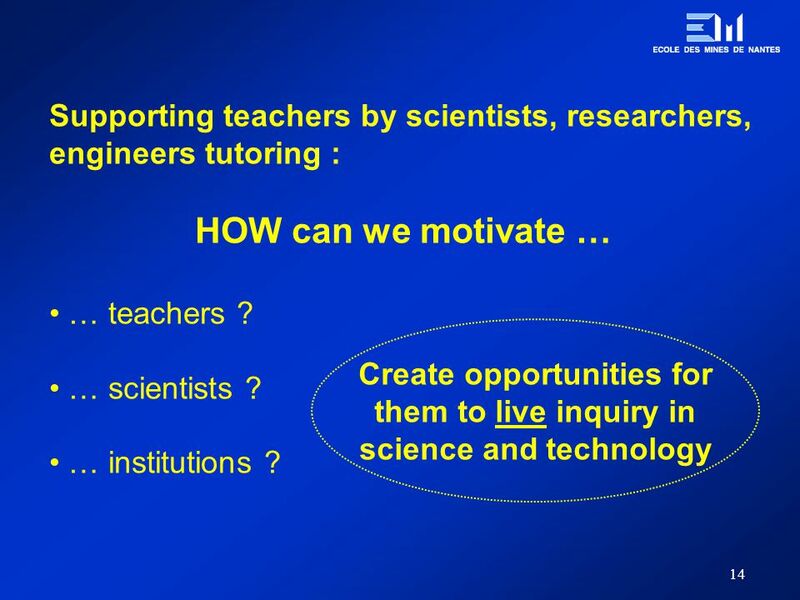 13 13 Supporting teachers by scientists, researchers, engineers tutoring : WHY ? 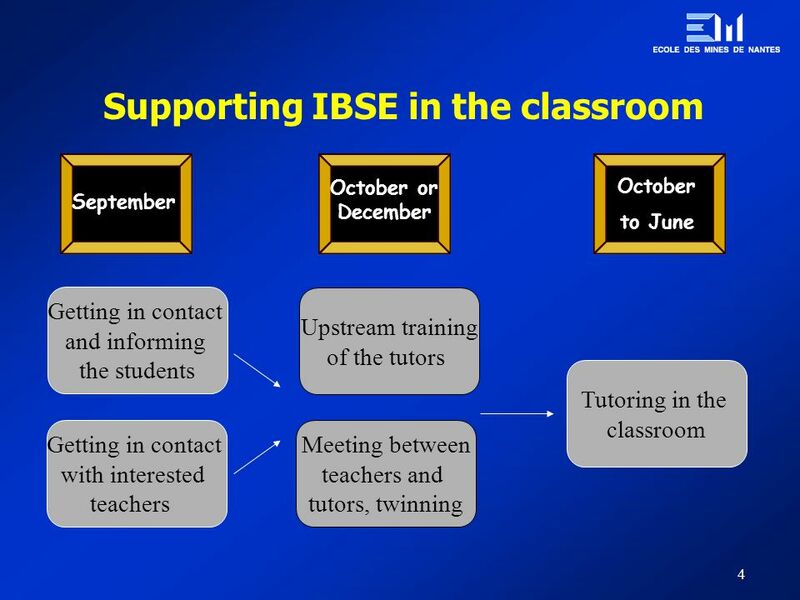 From the teacher’s side : In primary schools : obvious … but for secondary schools ? 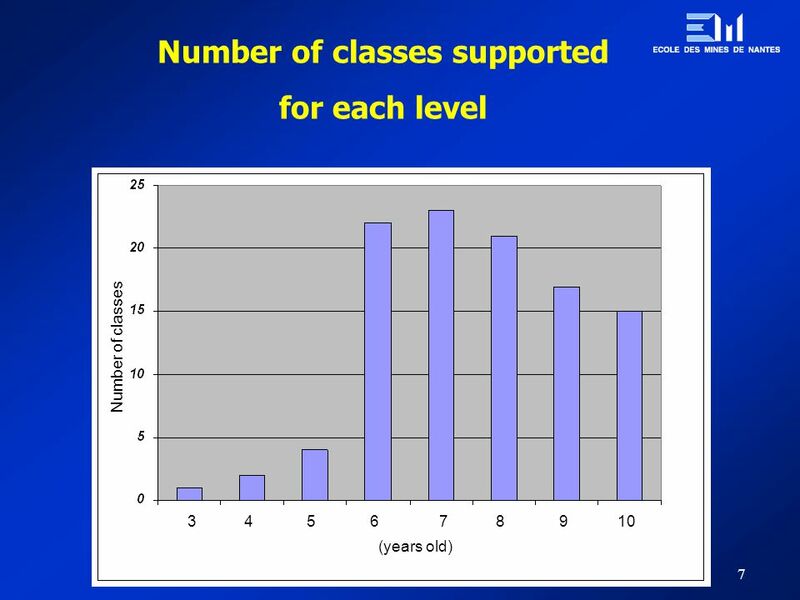 At university level ? 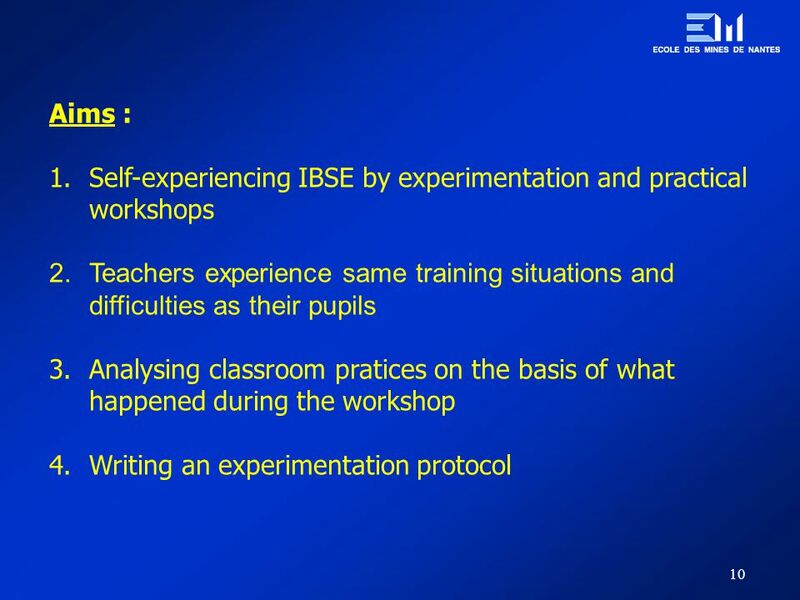 From the scientist’s side : What have they to learn through this experience ? 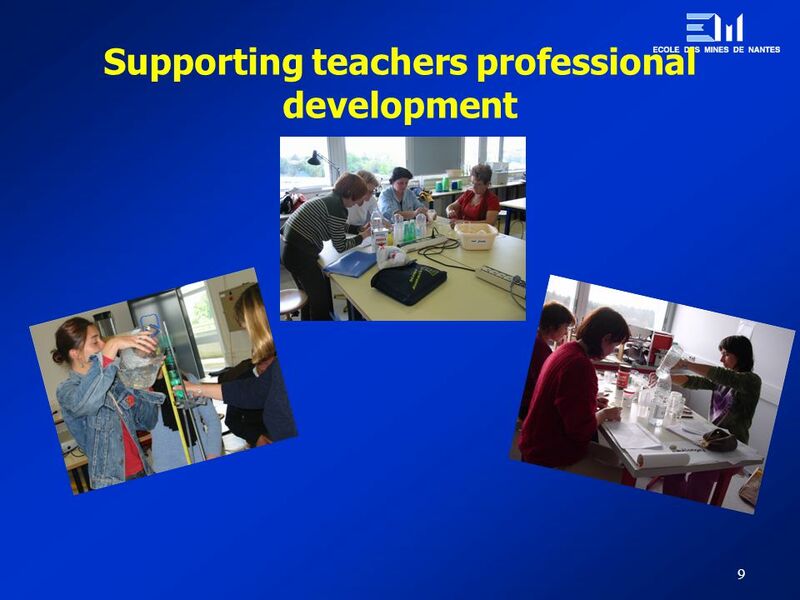 Download ppt "1 Supporting teachers A partnership at Ecole des Mines de Nantes." EPL Ecole polytechnique de Louvain Advisory Board du 10 janvier UCL Bologna Conference on Student Mobility Bologna and the internationalization. The Loire river. The Loire river is in France. The Loire river is 1,013 km long. La conversion. Jean-Louis Vignes mars 2009 La conversion But : obtenir un composé d'uranium gazeux permettant la séparation isotopique t sublimation. 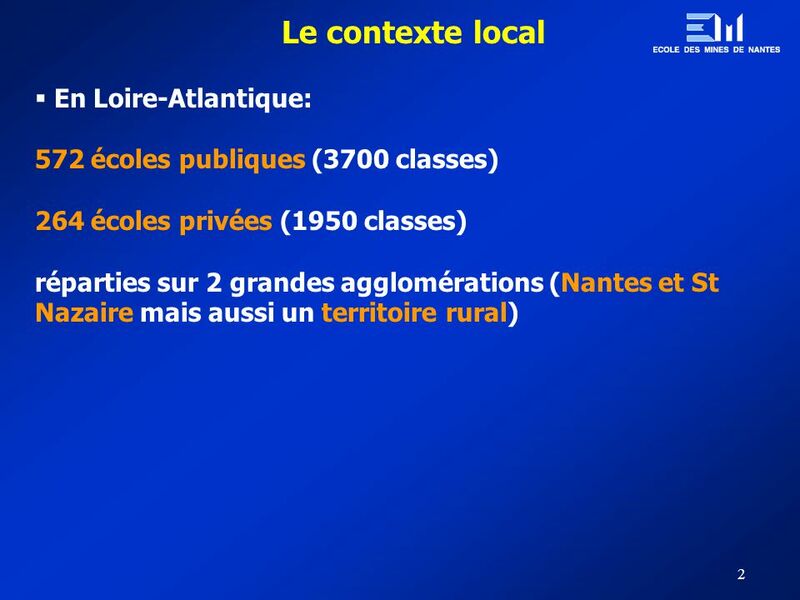 Establishing joint projects with a partner school A Presentation by Cathy Gaillard and Bill Elgar A) Background to the two schools - colleges Quelques. 10, 11 et 12 Décembre 2008 December , 11 and 12. LÉVOLUTION DES STRUCTURES FAMILIALES DANS UN MONDE ET LADAPTATION DES POLITIQUES FAMILIALES Nicole Prud homme Présidente de la Cnaf (FRANCE ) THE EVOLUTION. Client Logo 1© The Delos Partnership 2006 January 2006 LEAN ENTERPRISE Implementation Workshop. 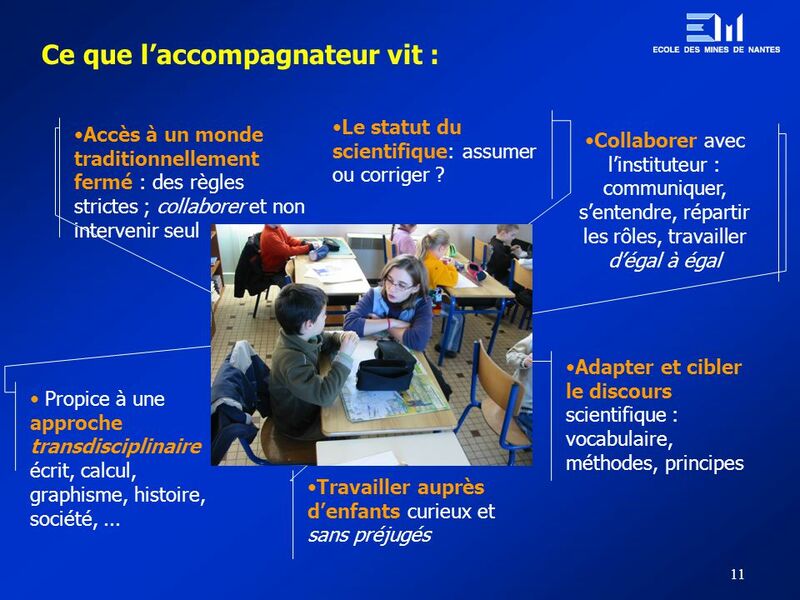 Pédagogie des Langues à lécole Intégration des Nouvelles Technologies Pédagogie des Langues à lécole Intégration des Nouvelles Technologies Technologically. (C) Emmanuel JAECK Warsaw 2009 Key factors of a quantitative indicator system EJ Emmanuel JAECK Prefecture of the Midi-Pyrénées region / France. Division Radio and Television Public Service Media Governance and the public Public Service Media Governance Consultation Meeting Strasbourg 17 – 18 September. 1 Grafcet point de vue système. 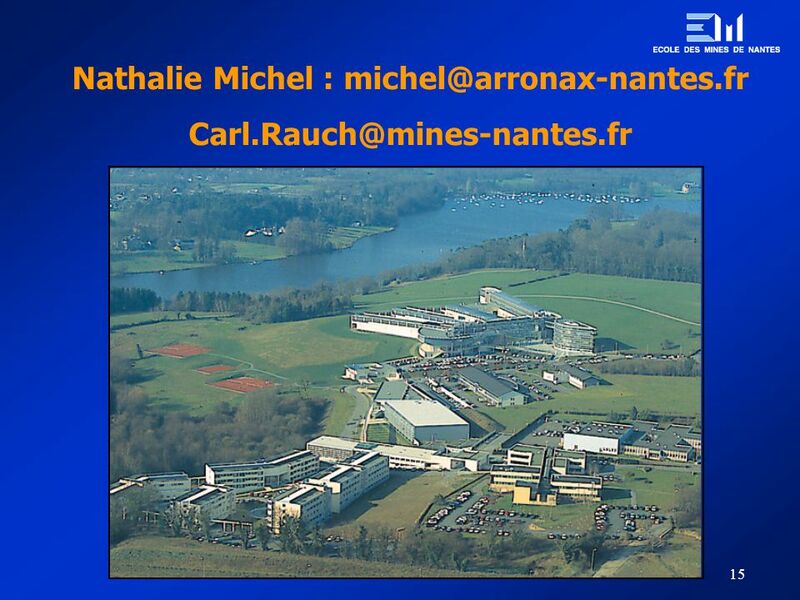 2 Cliquez pour mise en route 0P 0Z 1V 2V 2V 1 1V 1 1V 2 1Z BPR 0Z 3 0V 1A. 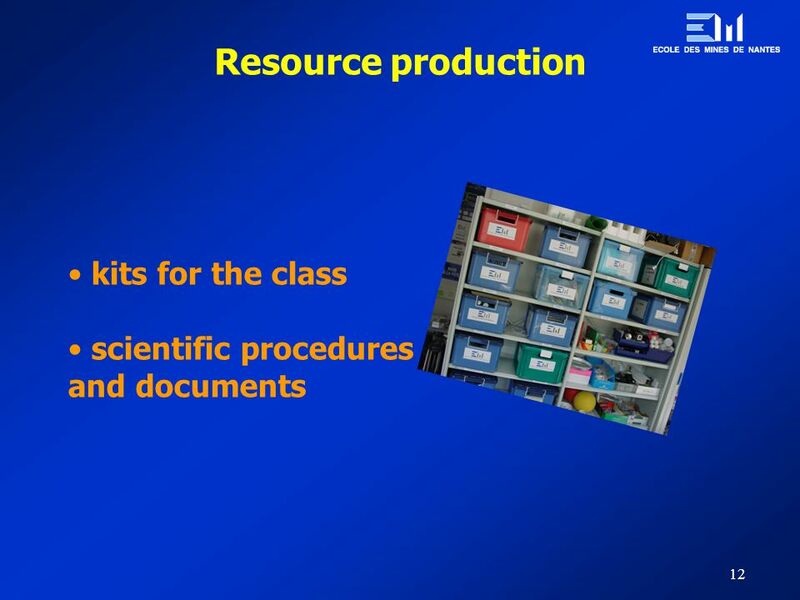 Site dinformation sur les données de la recherche Herbert Gruttemeier (INIST-CNRS) Nordbib Conference Copenhagen, 12 June 2012. 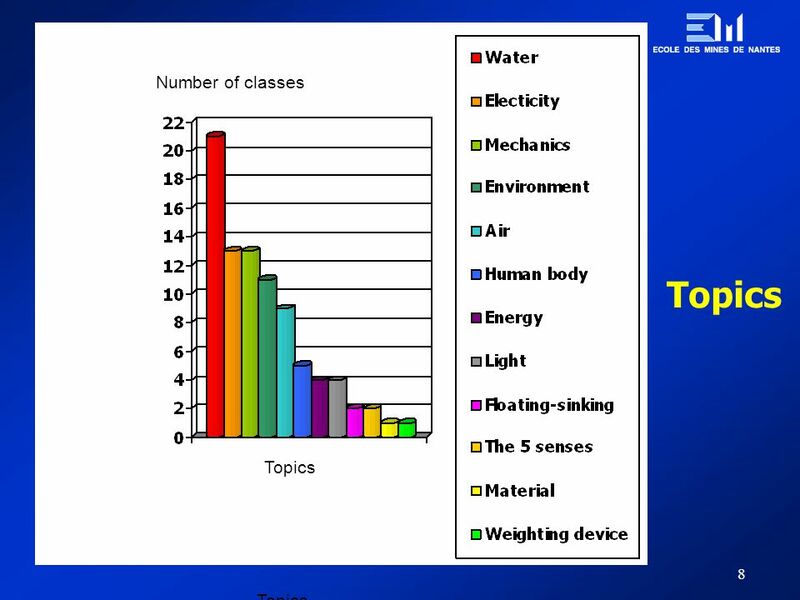 OECD Conf Mexico)_JB 9 December Presentation by: John Bangs, Assistant Secretary (Education, Equality and Professional Development) National Union. Page 1 26 th of NovemberE-learning quality – Greek Workshop Piraeus E-learning Quality in Higher Education Amaury Legait Ecole Nationale des Ponts et Chaussées. 1 Which 2 months are named after Roman gods?. janvier février mars avril mai juin juillet août septembre octobre novembre décembre.